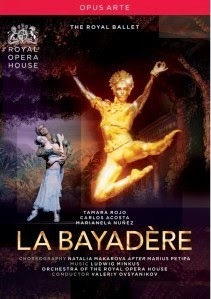 La Bayadere (The Temple Dancer) is a ballet in four acts and seven scenes, choreographed by Marius Petipa. It was first performed by the Imperial Ballet in St. Petersburg in 1877. Marianela Núñez (born in San Martín, Buenos Aires 1982) is an Argentine dancer. She is a principal dancer with the Royal Ballet, London. Of her performance one leading critic commented “every gesture sings, every step is luminous with emotion. The result is sublime“.